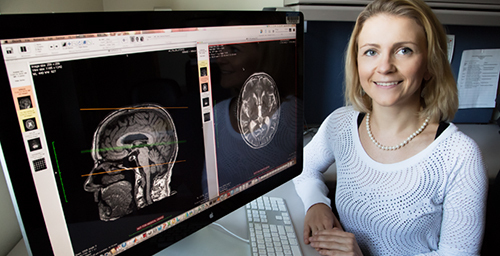 University of Illinois Beckman Institute postdoctoral researcher Agnieszka Burzynska and her colleagues found that physical activity and sedentary behavior are each associated with specific differences in brain white matter integrity. CHAMPAIGN, Ill. - Like everything else in the body, the white-matter fibers that allow communication between brain regions also decline with age. In a new study, researchers found a strong association between the structural integrity of these white-matter tracts and an older person's level of daily activity - not just the degree to which he or she engaged in moderate or vigorous exercise, but also whether the person was sedentary the rest of the time. The study, reported in the journal PLOS ONE, tracked physical activity in 88 healthy but "low-fit" participants aged 60 to 78. The participants agreed to wear accelerometers during most of their waking hours over the course of a week, and also submitted to brain imaging. "To our knowledge, this is the first study of its kind that uses an objective measure of physical activity along with multiple measures of brain structure," said University of Illinois postdoctoral researcher Agnieszka Burzynska, who conducted the research with U. of I. Beckman Institute director Arthur Kramer and kinesiology and community health professor Edward McAuley. Most studies ask subjects to describe how much physical activity they get, which is subjective and imprecise, Burzynska said. The accelerometer continuously tracks a person's movement, "so it's not what they say they do or what they think they do, but we have measured what they are actually doing," she said. The researchers assumed that participants' activity levels over a week accurately reflected their overall engagement, or lack of engagement, in physical activity. The study also relied on two types of brain imaging. The first, diffusion tensor imaging, offers insight into the structural integrity of a tissue by revealing how water is diffused in the tissue. The second method looks for age-related changes in white matter, called lesions. Roughly 95 percent of adults aged 65 and older have such lesions, Burzynska said. While they are a normal part of aging, their early onset or rapid accumulation may spell trouble, she said. The team found that the brains of older adults who regularly engaged in moderate-to-vigorous exercise generally "showed less of the white-matter lesions," Burzynska said. The association between physical activity and white-matter structural integrity was region-specific, the researchers reported. Older adults who engaged more often in light physical activity had greater structural integrity in the white-matter tracts of the temporal lobes, which lie behind the ears and play a key role in memory, language, and the processing of visual and auditory information. In contrast, those who spent more time sitting had lower structural integrity in the white-matter tracts connecting the hippocampus, "a structure crucial for learning and memory," Burzynska said. "This relationship between the integrity of tracts connecting the hippocampus and sedentariness is significant even when we control for age, gender and aerobic fitness," she said. "It suggests that the physiological effect of sitting too much, even if you still exercise at the end of the day for half an hour, will have a detrimental effect on your brain." The findings suggest that engaging in physical activity and avoiding a sedentary lifestyle are both important for brain health in older age, Burzynska said. "We hope that this will encourage people to take better care of their brains by being more active," she said. To reach Agnieszka Burzynska, email agaburza@illinois.edu. The paper, “Physical activity and cardiorespiratory fitness are beneficial for white matter in low-fit older adults,” is available online or from the U. of I. News Bureau.